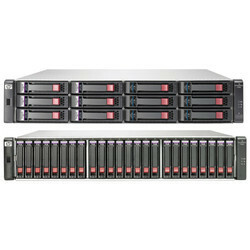 Prominent & Leading Ecommerce Shop / Online Business from New Delhi, we offer hpe msa 2040 storage. Changing storage needs for server customers now requires greater levels of performance and functionality at a lower cost of ownership. The next generation HPE MSA 2040 Storage arrays raises the bar & uniquely addresses HPE ProLiant customers' shared storage and data protection needs, reduces TCO while dramatically increasing performance using technologies such as Solid State Drives, Snap and Volume copy, Replication and SEDs. The MSA 2040 Storage arrays are positioned to provide an excellent value for customers needing increasing performance to support initiatives such as consolidation and virtualization. The MSA 2040 delivers this performance by leveraging new controller architecture with a new processor, four ports with 4GB cache per controller & using drive technologies such as SSDs. The MSA 2040 Storage ships standard with 64 Snapshots and Volume Copy enabled for increased data protection and allow replication with optional Remote Snap software between arrays (FC or iSCSI only). Looking for IT Storage ?